Welcome to Garden Bloggers' Bloom Day here at May Dreams Gardens! What a mess August has made of my September blooms! Well, it isn't all of August's fault, some of the blame lies with the first two weeks of September, too. Oh, and June and July have to own up to what they did, too. And just yesterday Hurricane Ike, or what was left of it, came through and tried to blow everything away. I mostly remember this summer as starting out very wet in June, then being very comfortable and enjoyable in July with moderate temperatures and rain when we needed it. Then in mid-August, the rain disappeared and didn't return until this past week. I've never seen plants dry up so quickly and the lawn seemed to go dormant almost overnight. My excuse theory for why the plants dried up so quickly is that they got all lazy with the plentiful rain in June and July and didn't grow any deep roots looking for water. The water was always right there. Right there at the surface. Then when the rain stopped and the water wasn't right there in the first few inches of dirt, the plants had no deep roots to go after deeper reserves of moisture and therefore just dried up. What do you think of that excuse theory? Let that be a lesson to all on what happens to lazy plants, and people, too. But now the rain has returned and the plants are growing and flowering again, so all is not lost and I have high hopes for fall. 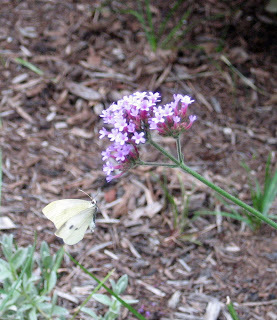 The Verbena bonariensis pictured above has been blooming for a few weeks. I generally let it self sow a bit and come up here and there in the garden becomes it blooms late when not a lot of other new blooms are around. 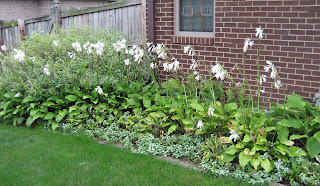 I'll have to remember that the August "lilies" (Hosta) provide a good show in September, too. And they still have a sweet scent to them! Notice that the lawn has turned green again? It was very tan a week or so ago before we got some rain. I have sedum (Stonecrop) all over the place, partly because it is an easy plant to dig and divide in the spring and I keep moving it around, dividing it each time. 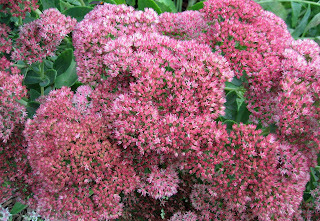 This is probably a Sedum telephium, variety unknown, or possibly Sedum spectabile. Or it could be Hylotelephium telephium or Hylotelephium spectabile, which are the new botanical names for these sedums. Or we could go with the other common name, Witch's Moneybags. I don't remember where I got it or how it came to be in my garden, but I like the dark rosy pink blooms. Nearby is Sedum erythrostictum 'Frosty Morn'. This is supposed to have variegated leaves, but it has mostly reverted back to plain green. And it has gotten all floppy this fall, whereas the other variety has not. I suppose, by the way, that like the other sedum, this one, too, could have a new botanical name. Let's just call it 'Frosty Morn'. My best blooms this month are these Colchicums. Where have these been my entire gardening life? Thank you to Kathy from Cold Climate Gardening for sending them to me last fall. I especially like how they come up through the sedum groundcover. It makes it less obvious that there is no foliage, just flowers. What's blooming in your garden? I'd love to have you join us for Garden Bloggers' Bloom Day. It's easy to particpate. Just post on your blog about your mid-September blooms and then come here and leave a comment so we can find you. Your Sedums & Hostas look great Carol. Mine look kind of ragged at the moment after a hot August. 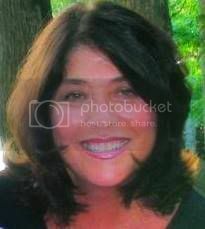 I have my post ready at http://perennialgardener.wordpress.com/ Thanks for hosting GBBD! My GBBD Post is up, too, HERE. I am totally subscribing to your excuse--er, theory, by the way. I think that my plants must have gotten all lazy, too, because they seemed to do the same thing yours did. I hope that they all learned their lessons! lol. Your colchicums are very pretty. I love seeing them popping up through the little sedum foliage. Hi, Carol, I've posted my GBBD contribution. Your hostas look fantastic and I'm very envious of your sedums. Your Colchiums look very pretty and your sedums look great, they seem to be much further along than mine at the mo. I'm very surprised that the Verbena bonariensis has only been in flower for a few weeks in your garden as it has been flowering in mine for months now. Perhaps there is a bigger difference in our climates then I thought? Hi Carol! I'd say your theory certainly sounds plausible. I'm glad you still have some flowers to share after all of those challenges. Your hostas are gorgeous, and their scent must be heavenly. Thanks for sharing! 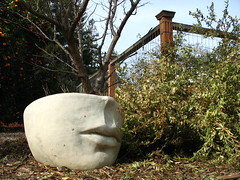 I've put up my own Bloom Day post at www.gardeninggonewild.com this month. Hi - my contribution to GBBD is here! Lots of lovely blooms in your garden. I've got lots too at The Gardener Side but they won't be around much longer. The wind and rain is making them fall over or droop much faster than usual. Sedums are just lovely at this time of the year aren't they? I was tempted by 'Frosty Morn' last week but resisted. Your warning about floppiness has made me think agai. I'm a bit of a lazy gardener when it comes to staking and the rest of my sedums are holding their heads up high at the moment in spite of my shocking neglect of them! I love the way they attract loads of butterflies and hoverflies at this time of year. My contribution's here - plus a new sparkly slideshow in my sidebar. Hi Carol, what is up with all the name changed, even our simple sedums? Why????? Anyway, you have tons blooming still and your theory sounds perfectly plausible to me too, darn lazy plants! This is my first bloom day using the new wordpress bog, hope you enjoy it and thanks as always for putting on this show. geez, how hard is it to proofread once in a while. I have a blog, not a bog, but would like to have a bog someday! Hi Carol - done my GBBD post for this month, felt bad as I missed August as I was so fed up with the weather but the sun is shining now and really lifting the spirits. I love the August Lilies--I have the perfect place for some too! No matter what you call them, those sedums look beautiful. And thanks so much for showing your verbena--that is the "mystery" plant I saw a few weeks ago that I wanted to identify. We've had the same weather here, just west of you in Illinois. My windblown flowers are on my GBBD post today. Thanks for sponsoring Bloom Day once again! Good thing I took shots the day before the record rains hits us here in Chicago. We've now got over 8 inches and might get more today. I have my GBBD post up. Hi Carol, your blooms look wonderful. It's a wonder anything's left blooming after Ike blew through. Thank you for all you do for the garden blogging community, and for hosting GBBD each month! I totally agree with your theory - I'm sticking with that word - Here in CT noticed the same the August dry period made things crunchy in a matter of days. And then the rains again here - super floppy sedums everywhere! next year they all get pinched back in June to 1/2 their size als Tracy D-A!!!! Your sedum look very impressive. Mine are just starting to peek out. Your theory does make a lot of sense! Love the sedums. And those colchicums look like must haves! The hosta blooms are definitely looking good. Here's my post for GBBD September, I've got a few shots of the wildflowers around our property in addition to some garden pictures. Well, my post will be up shortly, I thought I'd save time and come over here and make my comment now. Plus, I have to admit, I wasn't wanting to be down at comment 128 like I have been some months! In spite of your garden not being up to its usual snuff due to weather issues, it is still quite lovely. And I love colchicums too! They really save the "garden day" in the late fall. If you like those you should look into some of the other varieties out there. Not that I am trying to be the great tempter here. . . I don't know if I have ever adequately thanked you for beginning this meme. It has been one of my favorite blogthings to do. Thanks Carol! I'm glad your grass is green again Carol! It looks much better that way. Your stonecrop is quite pretty...and way ahead of the one I have. My post is up too, now. Your garden is so lovely! Mine is looking a bit brown and sad, but I do have a few things in bloom! This is my first time participating in this tradition, thank you! In spite of the rain, I've got mine done too: http://tinyurl.com/59vhy2. I noticed that the August lilies (Hosta plantaginea) had the strongest scent in the rain. Maybe the scent couldn't waft about the garden with the rain pouring down like a wall. I've never heard the common name "Witch's Moneybags" for Sedum. It must have something to do with the foliage. I hope you'll be flattered by my theft of the idea of growing the Colchicums through the prostrate Sedum. I have both plants, why have I never put them together? Hi, Carol. I am SO jealous of your hosta--ours are long over (and the larger ones don't do so well anyway). But here's what IS blooming in my Virginia garden: cosmosgarden.blogspot.com. I love GBBD. Hi Carol - I think your sedum "Frosty Morn" is a very pretty colour especially combined with the deep rich colour of the "Witch's Moneybags" I have not heard sedum called that before! Thank you for hosting GBBD - my post is up. I love your Colchicums, Carol. Always a beat and a half off, I seem to miss GBBD but posted mid-Sept. flowers yesterday ... if that counts! Thanks for hosting. The Colchicums are beautiful! I love it when beautiful things poke up through a wonderful groundcover. Unfortunately in my garden it's usually weeds poking up. Thanks for hosting Bloom Day, Carol, and Happy Gardening! I love those colchicums! I wonder if they'd work here in Austin in the cooler months? My GBBD post is up now, too. 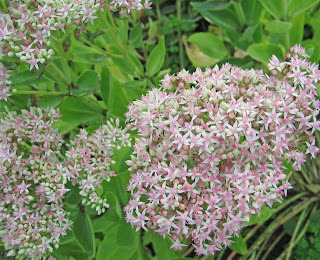 Hi Carol, I enjoy the "tall" Sedum for late-summer and fall blossoms! Yours look great. I've divided my variegated leaf sedum often... and the RAIN we've had lately has really caused many of them to droop! Those that aren't drooping, though, are being supported by those "grow-through rings" with removable legs. In the fall, after everything has gone dormant, I remove the rings and legs and hang them until Spring. Hi Carol, It seems like it's been a tough summer for a lot of us. (I have all sorts of *excuses* for my garden at home - few theories.) Your garden looks to be plenty abundant and gorgeous. Thanks, as always, for being such a terrific Bloom Day host! The hosta flowers are so tall and beautiful, Carol - and I love the way the Colchicums emerge from that sedum...assuming it still gets to be called sedum. But aren't you being a little hard on the plants by calling them lazy? With all that water saturating the ground didn't they have to use their surface roots or drown? It's not their fault Nature shut off the sprinklers! I have a GBBD post on my blog, too. Ack the one Latin name I put in my post and that is the name they decided to change. I can never keep track. I think I'll just start calling it 'Autumn Joy' and be done with it. I have not felt like this summer was especially fabulous or notable. Notably cold, perhaps. Sigh. It's always gotta be something. Lovely to see what's growing in others' gardenes. My post is now up. Thanks Carol! I agree with your theory and love, love, love your autumn crocus!! I missed August because I was out of town. My garden post is up but the pictures don't do it justice. Your garden looks and sounds absolutely magnificent. Beautiful blooms, Carol! I don't think you need to worry about excuses. For having such wet and then droughty weather your blooms look good and you have quite a few too Carol. It is good to hear that you, or your garden, didn't blow away yesterday. I got a GBBD post up this month. I missed last month for some reason. Your hostas look so full and healthy! Mine have already reached crinkly-brown and yellow stage. You reminded me that I have colchicums SOMEWHERE in my beds - I need to keep an eye out forthem, hate to miss 'em. I think your theory is spot on! And your hostas are lovely. Only the ones in total shade here look good. The rest look like they've been under the broiler. 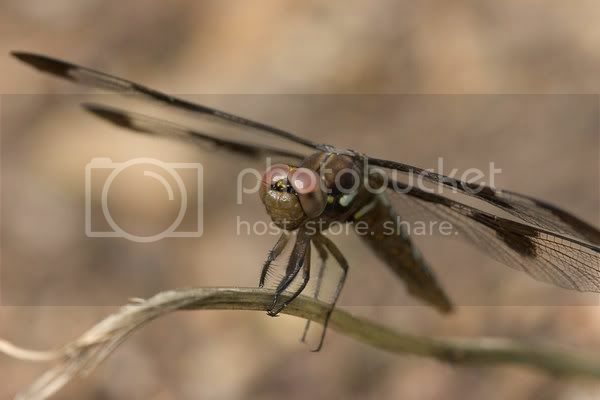 I got around to making a post today, so if anyone would like to check out my garden, please stop by and visit. Carol, how lovely your garden looks despite your reported laziness. It has been a challenging summer for weather. I'm not contributing to GBBD. Neglect would be the best word to describe a yard left to Boston-based tenants for a year while we were living in England. I'll get vicarious garden joy by visiting other gardens. Thanks for organizing another GBBD. Hello Carl, thank you for hosting another GBBD. Your seduns look great! Hi carol, I have my post up. Thanks again for hosting. This is always fun. Here's something off the subject, Carol. 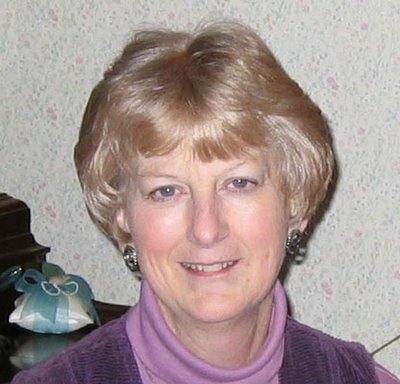 I just discovered an author from Indiana, Haven Kimmel. Do you know of her? 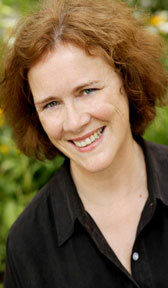 I have been enjoying her writing a lot, and learning about your state in the process. Your garden looks like it's blooming well Carol, despite the crazy unpredictable weather:)! There's not a lot blooming in our neck of the woods~ my short post is up as well~ The Last Hurrah:). I'm surprised it was so dry. I think of us as being on the edge of the midwest and we've been totally rainy. Looks great though! I have my GBBD post up. Even though we have been having bad weather lately, I was surprised how many flowers were still presentable. 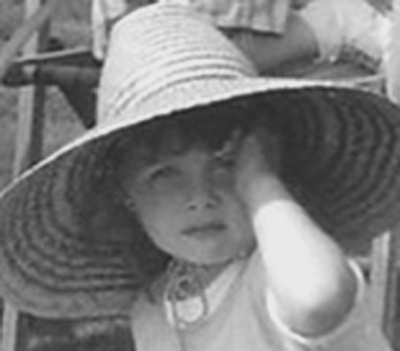 I have a post for Bloom Day and it is here: http://intheweedswithguthrie.blogspot.com/2008/09/bloom-day-september-2008.html. I love the color of your first sedum picture. I remember growing up my Mom called those "live forevers." Love your sedum photo! Lovely! Here is my bloom day post. My cup-and-saucer vine is blooming it's head off! I just love the changing colors of the blooms! I am glad you are enjoying the colchicums. Several kinds are featured in my bloom day post as well. The sedum looks so cool- I wish we could grow it. Love your hostas, Carol. The deer keep munching mine down to the ground. And your sedum are thrilled that it's getting to be Fall. Still too hot here for blooms, I think. I should have some next month to show. My post is up and it's still the 15th -- whoo hoo. Thanks for hosting. Carol, Those Colchicums are absolutely amazing! I want some, too, but I seriously doubt if they can grow in Austin. Thanks for posting them for me to admire. I have one August 'lily' blooming but forgot to take a photo of it. Imagine that! 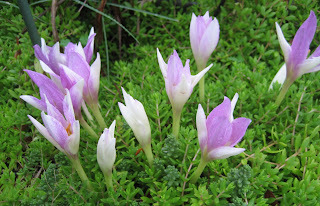 Yours are wonderful, as are your sedums and oh, lucky you to have some Cold Climate colchicums! They're gorgeous! My post is late again, but it's up. Plenty of lovely blooms in your garden, Carol! What a great bunch of fall blooms I'm seeing in September! Thank you to everyone for posting for bloom day. I'm caught up on reading and commenting on all the posts, as far as I know. If I missed yours let me know. And, if you are just arriving and think you missed bloom day, feel free to post anyway, we'll be glad to see what you have blooming, too! Loving your stonecrop and hostas, neither of which will do anything for me here in Austin. My post is finally up too, Carol. I can see that I have to get an earlier start on this. But I am only in Week 4 of blogging and this is my first GBBD post. June was floods, July and August were bone dry and now it seems like we may be back to some degree of normalcy here in southern Wisconsin — if we don't get a freeze first. I'm going to have to point to my post on the 13th to be my bloom day post as just now...most of the blooms have just been blown away by Hurricane Ike. I hope I can get online more often to check on everyone's blooms! OK, I love the Colchicums! Where can you find them? Hi Carol! Blogger was frustrating me horribly, but I finally got my post up here. I'm home! Arrived home last night, and took a few flower photos this morning. Here's my post. I completely missed August, but the September post is up. Better late than never! Things sure look different compared to last year. Even with our drought conditions last summer I had better looking blooms then. Hi Carol. The WWWs did a GBBD post--probably the latest GBBD post EVER! Carol, I'm late - but at least it's still September! The fun thing about being late is I get to see all of the comments, and how so many people are posting for Bloom Day - wow! I'm catching up, I'm catching up! Here's September, and tomorrow I can post *this* months on the October post! Yay! Here's my hellebrore in the mountains of western NC awaiting two nights of temperatures below ten. 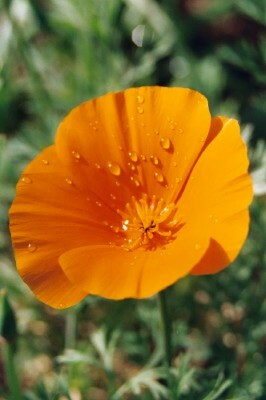 But then it, and I, intend to forge forward and bloom onward. How wonderful to see all the flowers!